Ross Fargher, rancher and landowner of Nilpena cattle station, in his wool shed. Jason Irving. NILPENA CATTLE STATION IN SOUTH AUSTRALIA—Fly over the cattle station here in a Cessna 172 and you’ll see a dry riverbed snaking through brown, mottled earth punctuated by the occasional patch of saltbush. There’s no sign of the 200 cattle currently being run on this property, which is about the size of New York City and sits 450 kilometers north of Adelaide, Australia. But cattle are not the main asset of this remote station. Instead, Nilpena’s prize specimens lie exposed and motionless on the gentle slopes of Mt. Michael like some open-air diorama: the weird forms of Earth’s first multicellular creatures, frozen in rock for 560 million years. About 60 species from the Ediacaran period pattern the hillside, the richest collection of such forms on Earth. Some creatures exhibit bilateral symmetry, others the trifold symmetry of the Mercedes-Benz logo; still others resemble heraldic shields, or are leafy with a repeating, fractal structure. The plethora of species here isn’t the only thing that sets it apart. Almost alone among Ediacaran sites, Nilpena preserves entire communities of organisms, intact because of ancient accidents of preservation and the foresight of its modern landowner, a rancher named Ross Fargher. At Nilpena, “We can see who was living with whom and what they were doing,” says paleontologist Doug Erwin of the Smithsonian Institution’s National Museum of Natural History in Washington, D.C. Whereas most paleontologists study early life forms through museum specimens, here they can see the animals—for that is what many of the Ediacaran creatures appear to be—in the context of their ecosystems. “We invented a new way of doing paleoecology here,” says University of California, Riverside, paleontologist Mary Droser, who, together with Jim Gehling of the South Australian Museum in Adelaide, has worked on the fossils for the past 17 years. Droser and Gehling have published more than 40 papers describing a peaceful, predator-free community where segmented creatures such as the pancake-shaped Dickinsonia—up to a meter long—and mollusklike Kimberella grazed on slimy bacterial mats; tiny helminthoidichnites tunneled just below the surface; and tethered, leafy, fractal creatures absorbed nutrients from the seawater directly through their outer skin. Researchers owe that opportunity to Fargher. For more than 30 years, he has helped guard the fossils from looters who have pilfered nearby Ediacaran sites; he also runs tours and helps scientists with logistics. But in recent years, ranchers in the region have struggled with persistent drought and low beef prices, and researchers have worried about what would happen if the 59-year-old Fargher were to sell his property. “We all thought Fargher’s efforts were remarkable, but we also thought: what now?” Erwin says. 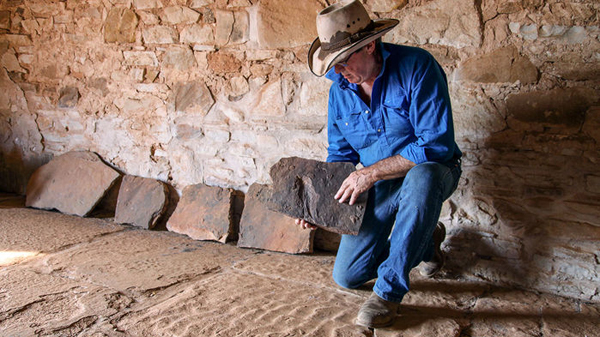 Clad in blue jeans with a prominent brass belt buckle, boots, and Akubra hat, Fargher comes across as an iconic outback stockman, with an easygoing, forthright manner of speaking. But he quickly veers off script. As he leads a group of tourists across the fossil beds, Fargher holds forth on the life and times of Ediacaran creatures. On one rippled golden rock, he points out a large imprint the size of a dinner plate made up of concentric circles. It’s not a complete animal, he tells us, but the holdfast for a frondlike creature called Arborea that was torn off by a storm that swept across the ancient sea floor and buried this community in sand. Arborea’s fractal body design disappears from the fossil record at the end of the Ediacaran period. But some of its bilaterally segmented neighbors may provide the answer to “Darwin’s dilemma”: Where did today’s animal life come from? Sites from the Cambrian period, 541 million to 490 million years ago, reveal an explosion of novel animal forms. But when Charles Darwin published On the Origin of Species in 1859, all known older rocks were barren of life. He called the lack of earlier forms “inexplicable” and wrote that it “may be truly urged as a valid argument” against evolution. Then in the 1940s, Australian geologist Reginald Sprigg, exploring in the Precambrian rocks of the Ediacara Hills 15 kilometers north of here, discovered imprints of a pancakelike shape divided by segments emerging from a central ridge. He named it Dickinsonia after his boss, Ben Dickinson, director of mines in South Australia. Later, amateur naturalists unearthed a plethora of smaller fossils at the same site, among them Spriggina, which resembled a segmented worm up to 3 centimeters long with a horseshoe head. Finally, in 2004, the International Union of Geological Sciences proclaimed a new geological period—the Ediacaran—from 635 million to 541 million years ago. Concentric circles, once thought to be jellyfish (left), are now known to represent a holdfast that tethered a frondlike, fractal creature such as Arborea to the ancient sea floor. Ediacaran communities also included the pancakelike, segmented Dickinsonia (right), which reached up to a meter in length and appears to have been an animal. Jason Irving. Researchers are still puzzling over exactly how the Ediacara relate to the rest of life on Earth. Many look nothing like modern organisms. But, Narbonne says, “A consensus is emerging that Ediacaran communities include the ancestors of the animals we see around us.” That interpretation got a big boost in September 2018, when other researchers examined Dickinsonia fossils from Russia that retained a dark film of organic matter. They detected a cholesterollike molecule that is the biochemical signature of animals. Other Ediacaran sites have been discovered in the United Kingdom, Namibia, Canada, Russia, and China. But Nilpena offers something rare: slabs of ancient sandstone, some bigger than a tennis court, that record entire ancient communities. Periodic storms repeatedly buried the ancient sea floor in sediment, preserving fine imprints of organisms “like a bologna sandwich,” Droser says, with the decaying organism as the bologna. Exactly how these prints were preserved on the underside of the sandy slabs here is a matter of debate. Gehling and Droser think the overlying sands turned to cement, perhaps because of high levels of the mineral pyrite, forming a death mask of the decaying creatures below. Another model, published this week in Nature Ecology & Evolution, posits that finer, more fluid sediments beneath the fossil flowed into the space vacated by the decaying creature, creating a mold that prevented the upper sand layer from collapsing. The size of the sediment grains determines how detailed the fossil impressions are. Some slabs with salt-size grains have revealed the 3-millimeter, shield-shaped Praecambridium sigillum. In other slabs, the grains themselves are up to 3 millimeters in size, making it hard to detect anything smaller than a centimeter.